William Reese. History, Education, and the Schools. Palgrave Macmillan, 2007. This book grapples with two basic questions. What is history? 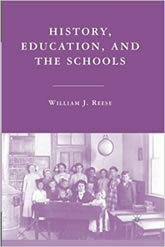 And How can history help illuminate contemporary concerns about the nature and character of America’s schools? From antiquity to the postmodern present, history has served multiple purposes, including a basic human need to learn from what came before. Americans have long invested considerable time, energy, and emotion in their schools, both private and public, and a knowledge of history helps explain why.